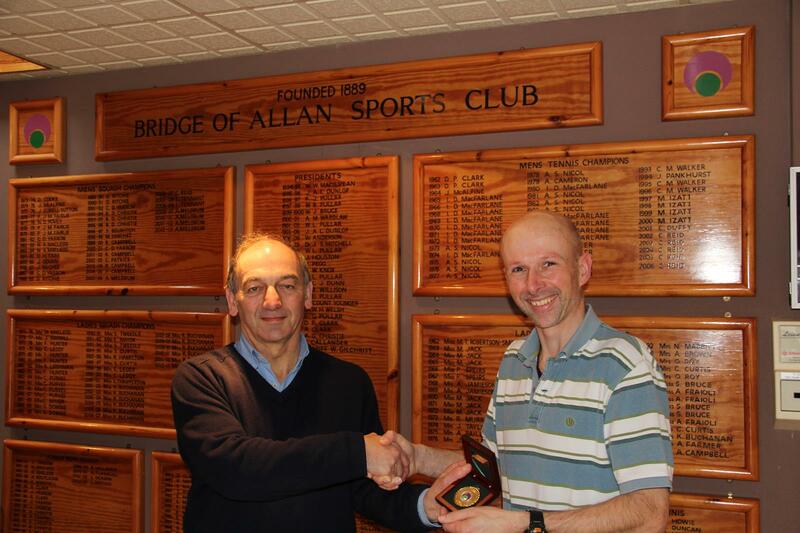 The Bridge of Allan Masters tournament was held at the picturesque former Spa Town at the Bridge of Allan Sports Club on 6/7 February. There were a total of 76 competitors who took part in one ladies’ and nine mens’ events. It was encouraging that there were sufficient entries to hold all 12 events. The main sponsor for the tournament was SKN Electrical Services. 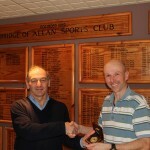 Walter McAllister and the Bridge of Allan Sports Club committee managed a very well organised tournament. The catering was excellent and the committee and supporters all worked hard to make all competitors welcome. At the prize giving, Peter O’Hara, on behalf of the competitors thanked Walter and the committee for all their hard work. Thanks are also due to SSRL (Lisa McKenna/Ross Cairns) and Ernie Cowell for managing the draws and supporting the Bridge of Allan Sports Club committee in running the tournament. 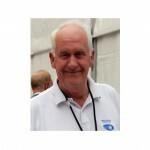 Mike Halpin, John Crawford and Matt Bain deserve thanks for providing marking services during the tournament. Alex Sinclair and Ernie Cowell quickly assessed the Bridge of Allan Masters results and updated the Masters Tournament Points. 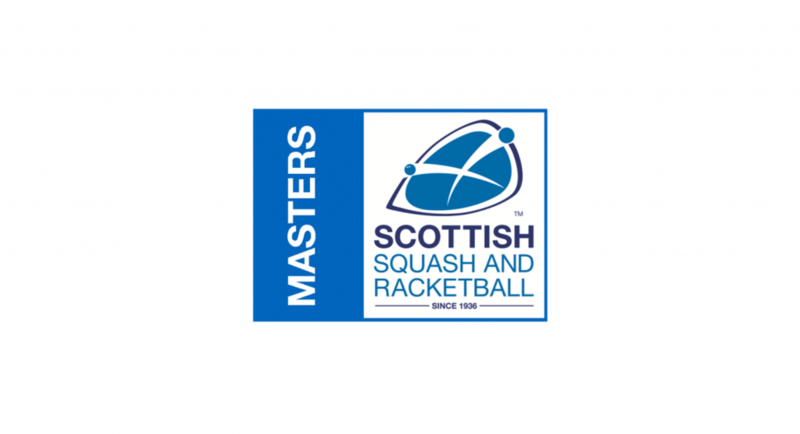 Alex emailed the updated Points to his Masters’ distribution list of about 350 players who have participated on the Scottish Masters circuit over the previous 10 years. There were three quarter finals on Saturday. The most competitive tie was between Heather Spens and Jennifer McArtney – this tie went to five tight games with Heather winning the fifth game and the match. 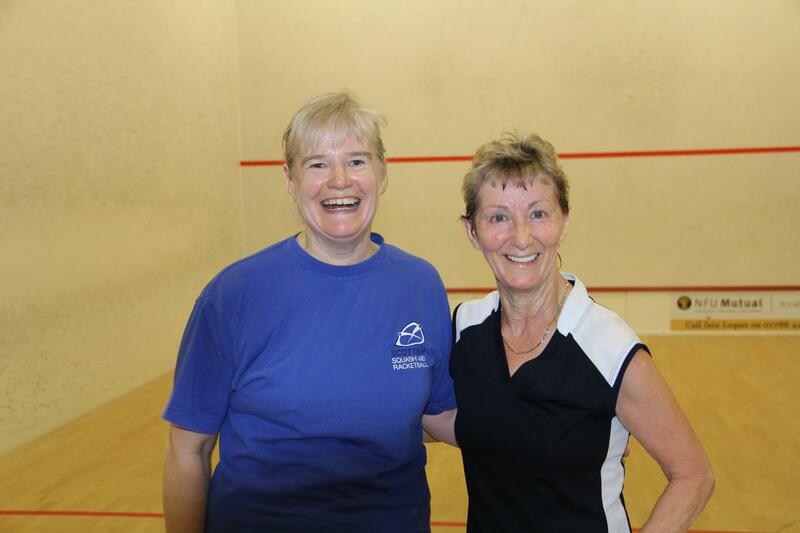 In the other quarter finals Moira Atkinson comfortably beat Norma Gregory 3-0 and Christina Graham beat Joyce Leach 3-1 – this reversed the result in the East Masters earlier in the month. 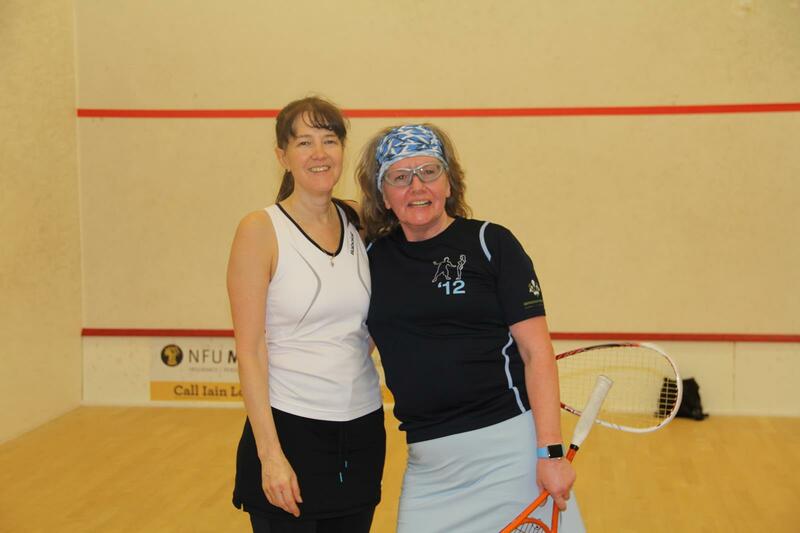 On Sunday morning the semi finals were played between first seed Pauline Douglas and Heather Spens and second seed Moira Atkinson and Christina Graham. 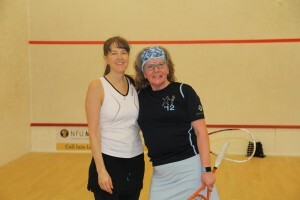 Heather started very well and won the first two games 9/3 and 9/7. Pauline fought back to win the next two games 9/7 and 9/5 to level the match. The final game was very close however Heather upset the seeding and won the fifth game 9/6 and the match. In the other semi final Moira played very well and beat Christina 3-0. 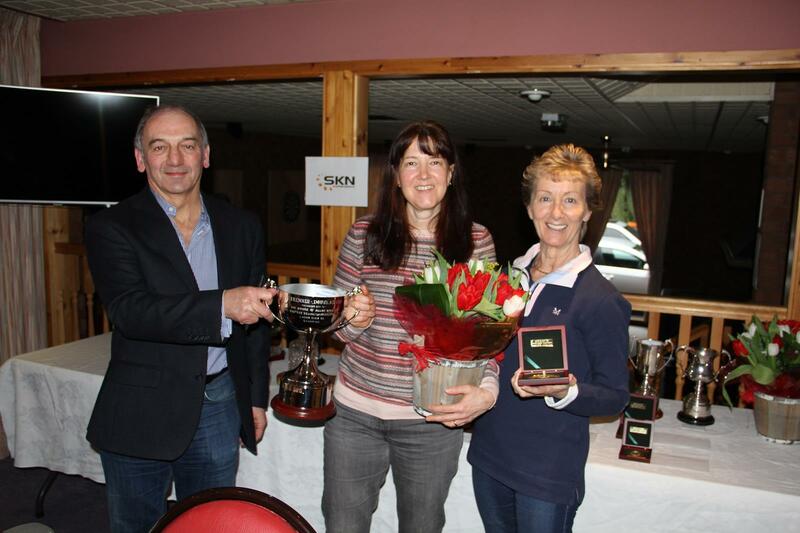 In the final Moira was the stronger player and benefitted from Heather’s earlier five game matches. Moira beat Heather 3-0 and won the Ladies O50 title. There were only two competitors in this event – this was very disappointing. Peter O’Hara played well and was too strong for Craig Duff, winning 3/0. There were only four entries and the competition was played as a round robin with four matches on Saturday and two matches on Sunday. 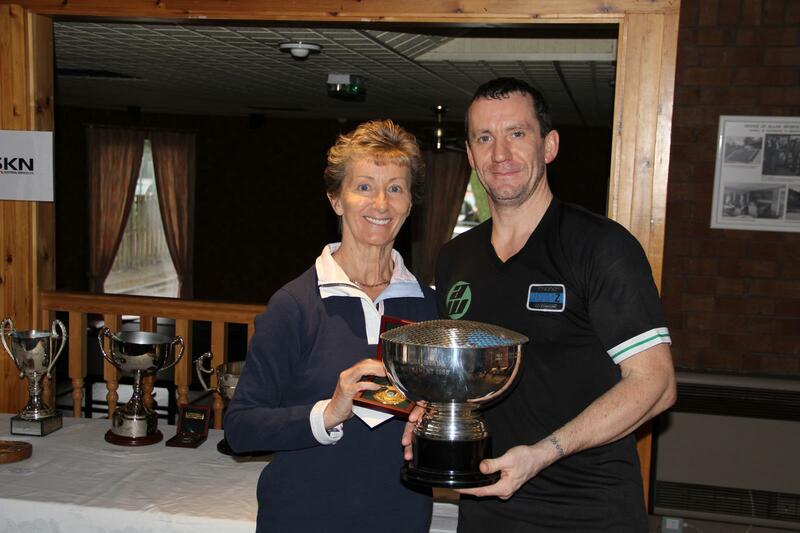 In the Saturday matches Peter O’Hara had comfortable 3-0 wins over John Kynoch and Doulas Emery. 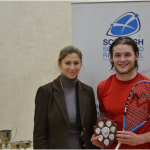 Roddy Campbell also won both matches beating John Kynoch and Douglas Emery 3-1. In the Sunday matches Douglas Emery proved too strong in beating John Kynoch 3-1. The last round robin tie which turned out to be the final was between Peter O’Hara and Roddy Campbell. Peter won the first two games and was leading 7/1 when he took a heavy fall which required medical attention. 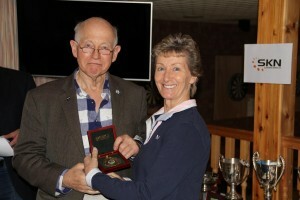 After treatment Peter returned to court and although looking a little fragile won the third game 9/3 and the O40 title. Roddy Campbell was runner up. In the Saturday matches Douglas Emery who has just qualified for the O45 event beat David Massey comfortably 3-0 and later in the day he beat Andy Meldrum 3-0 in a much closer match. In the other ties Andy Meldrum beat David Lindsay 3-0 and David Lindsay beat David Massey 3-0. 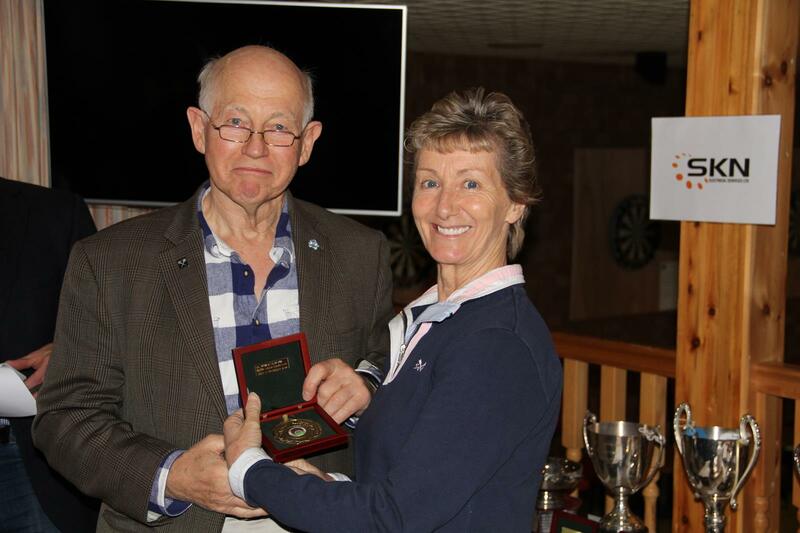 There were eight entrants in the Men’s Over 50 event, just enough for a simple knock-out. The competition kicked off on Saturday morning with matches between Colin McMullan and Archie MacGillivray and Tom Smith against Ronnie Carter. While Ronnie completed the job in straight games, it took a fifth game decider to settle the other match, with Colin the victor. In the next match on court, Graeme Patullo, returning after injury, came up against Bridge of Allan local Martin Sanchez, who has moved up an age-group this season. It was Martin who came out on top, with a clear 3-0 margin of victory. The last of the first round/quarter-final matches saw Brian Robertson play Ross Forbes from Dunblane playing his first Masters tournament. This match had an unfortunate and premature end when, early in the third game and with Brian two games to the good, Ross had a recurrence of a calf injury and had to stop. It is hoped that he recovers quickly and isn’t put off Masters’ squash by this experience. The semi-finals were played on Saturday afternoon, with the line-up being Brian against Colin and Martin against Ronnie. Colin got off to a good start against Brian by taking his opportunities well and successfully preventing Brian from settling into any sort of rhythm. With Colin one game up, the course of the match turned during the second game as Brian cut down his error count and made Colin work much harder for points. Having made the breakthrough to level at one game all, Brian was finally able to exert some control and push on for a 3-1 win. With only the final remaining in the main competition, attention turned to the Plate, where Tom and Graeme met for the right to play Archie in the final. The last time the pair had played in a Masters event, Graeme had come out on top, but here there was a reversal of fortunes as Tom won by 3 games to 1. Buoyed by that win, Tom went on to win the Plate final 3-0 against Archie. 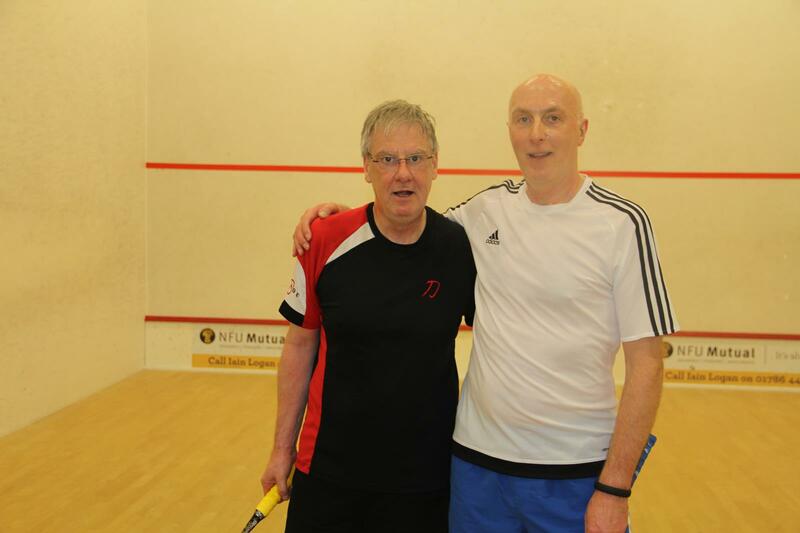 The final was the first time Brian and Martin had played against each other, which added an interesting dimension to the match as each player tried to identify the other’s strengths and weaknesses. The match was keenly fought but played in a sporting manner throughout and there was good squash and movement from both players. 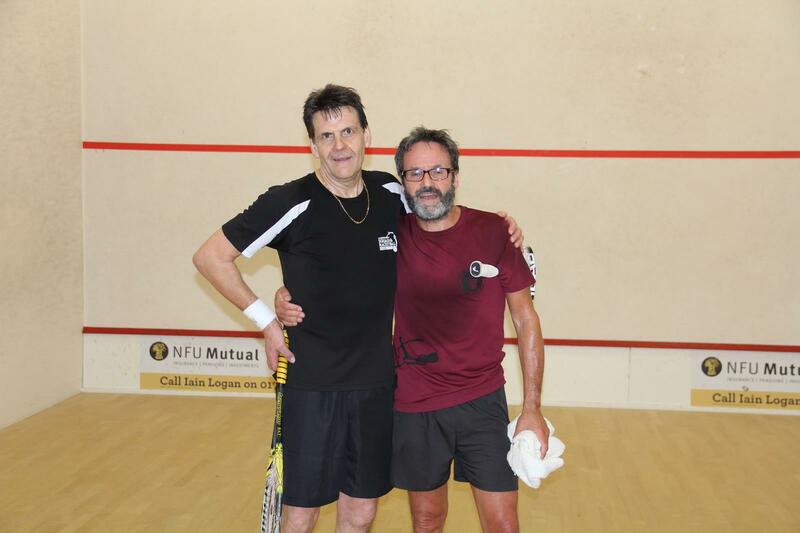 In the end, Brian had the edge in each game and completed a 3-0 win to continue a fine run of form in Masters’ tournaments this season. There were nine entries and the competition was played as a simple knock out. In the only first round tie John Black comfortably beat Lance Marshall 3-0. In the quarter finals Chris Holt beat John Black 3-0, David McAleese beat Rolf Hansen 3-0 and Richard Easton had a very good 3-0 win against second seed Alan Law. 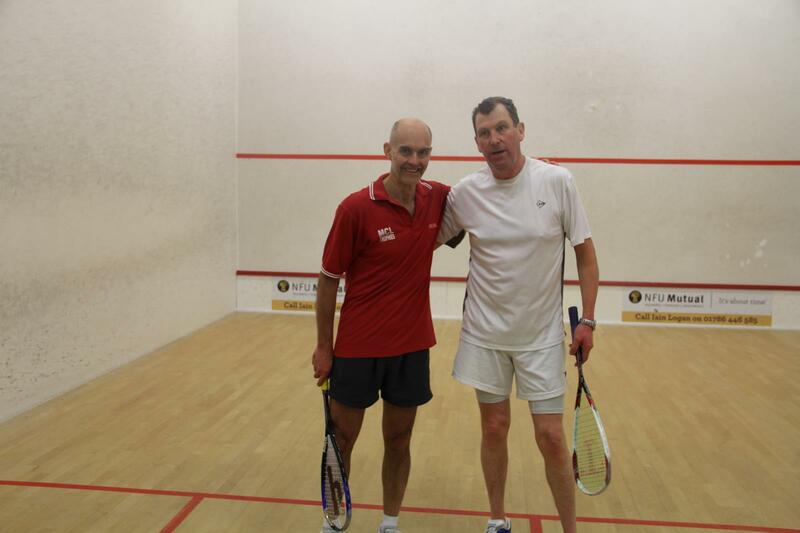 The tie between Keith Gristwood and Alan Susskind was a very competitive five game thriller. Alan started well and won the first game 9/2 however Keith fought back to win the next two games 9/4 and 9/1. Alan won a very close fourth game 9/7 and led 7/1 in the fifth game before Keith mounted a remarkable comeback to win the game 9/7 and qualify to the semi final. In the semi finals early on Sunday morning Chris Holt beat David McAleese in a tight three game match 10/8, 9/3, 9/5 and Richard Easton comfortably beat Keith Gristwood 3/0. 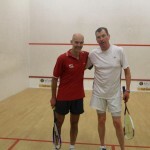 In the final Chris Holt started well against Richard Easton and won the first game 9/3. In the second game Richard played well but with Chris taking the ball early and moving Richard all round the court Chris won the second game 9/7 and he demonstrated his class by easily winning the third game 9/0 and the O55 title. There were eight entries and the competition was played as a simple knock out. The seeded players all won their quarter finals 3-0, but John Charles had by far the toughest match beating Ernie Cowell 9/8, 9/7, 9/4. In the semis the top two seeds only dropped 8 points between them with Paul Harris beating John Charles and Peter Shivas beating Eric Donohoe. And so to the final – Paul Harris v Peter Shivas. The match looked to be heading for a rapid, and slightly unexpectedly easy win for Paul who led 2 games to 0 and 5/1 in the third before the tide started to turn. The frenetic pace of the first half was gradually being replaced by a more considered, tactical style of which Peter is a master. In keeping with his love of chess, Peter continued to apply psychological pressure during the rallies, turning round a wide deficit in the third, edging a close fourth and sealing the win and the mental battle in style in the fifth. 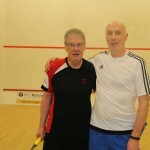 In the only first round tie Roy Gordon beat local player John McLaren 3-0. In the quarter finals the four seeded players Jim Dougal, Alex Everingham, Dave Sturman and Ian Ross had comfortable 3-0 wins against Roy Gordon, Warren Campbell, local player John Boswell and Phil Leek respectively. The semi final between Jim Dougal and Alex Everingham provided the biggest surprise of the tournament. Jim had just returned from holidays in London and South Africa but it was business as usual as Jim won the first game 9/2. Alex was much more focussed and competitive in the second game and turned things round by winning the second game 9/2. He continued his aggression and won the third game 9/5 and led 7/2 in the fourth game. Jim dug deep and started to get back into the game before Alex finally got over the winning line 9/7. This was the first time Alex had beaten Jim for eight long years. In the other semi final Ian Ross played Dave Sturman for the third time in the Masters tournaments this season. Ian started well and won the first game 9/4. The second game was very competitive and after several long rallies at 6/6 the game and match could have gone either way. Ian closed out the second game 9/6 and went on to win the third game 9/5 and reach the final. In the final between Ian and Alex, Ian was quicker out of the blocks and won the first game 9/4. The second game was much more competitive and Alex fought back well but Ian held on to win the game 9/6 and won the third 9/2 and the O65 title. 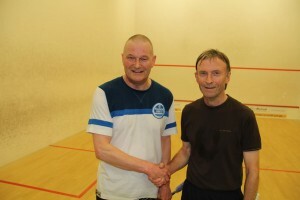 In the plate final between local players, John Boswell beat John McLaren. There was an entry of eight players. At the quarter-finals stage, the mostly closely fought match was between the two over-75s in the draw, Vinnie Taylor and Bill Perrie. Vinnie went two games up, only for Bill to pull back to 2-2, with some excellent volleys, however Vinnie just squeezed home 9/7 in the fifth. In the other quarter-finals, Dave Brown beat Douglas Raeburn 3-1, Ken Reid beat Alfie Thomson 3-2, in a closely contested match, and Ian Nicholson beat Mike Gibson 3-1, although Mike looked at one stage that he would take it to the fifth. In the semi-finals, Dave Brown beat Vinnie Taylor 3-0, with Vinnie looking a bit tired after his long match in the morning, and Ken Reid beat Ian Nicholson 3-0. In the final Dave was too consistent for Ken, beating him 3-1, and he also showed a new level of fitness which he partly attributes to forsaking, so far, the intake of lager for all of 2016! Thus, apart from Bernard Starkey – who is well ahead on the points table, there is keen competition for the next five spots to make up the national team, who play in the Home Internationals at Aberdeen on 20/21 May. There were only two entries, with Vinnie Taylor having a convincing 3-0 win against Brian Bathgate. At least three players are required for the Over 75s team which plays at Nottingham in the Home Internationals at May, so hopefully there will be a bigger entry in this age group in the next two events, to allow setting up a team of at least three players.